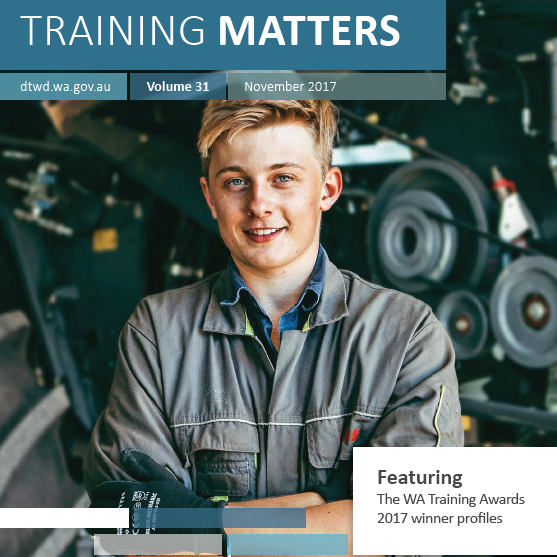 Training Matters is a magazine for the Western Australian vocational education and training sector. It provides high quality and informative editorial about the latest news and developments in VET and highlights the achievements of students, trainers and organisations in the sector. The full colour magazine has a distribution of over 5,000 copies electronically and in print and is published three times per year by the Department of Training and Workforce Development. From November 2017, the magazine will be available online only. The November 2017 edition of Training Matters is out now. You can download or view the November 2017 edition here. Training Matters welcomes submissions of story ideas and requests from advertisers. Contact the Training Matters editor at trainingmatters@dtwd.wa.gov.au for further information. Download previous issues of Training Matters. For more editions dating back to April–May 2008 please write to trainingmatters@dtwd.wa.gov.au.